Designed specifically for Pentax's digital SLR cameras, the Pentax 55mm f1.4 DA* SDM Lens is an ideal portrait or still life lens. When used on Pentax's digital SLRs it offers an equivalent focal length of around 85mm (in 35mm film terms) which is perfect for flattering portrait shots. The f/1.4 maximum aperture produces soft graduation in out-of-focus areas of your images and also provides superb low-light performance, allowing the photographer to get the best out of available light sources. 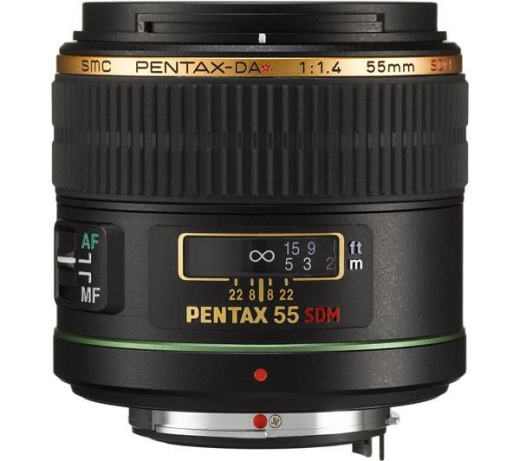 The SDM focus system incorporated in the Pentax 55mm f1.4 Lens results in a smoother, quieter auto-focusing operation using a built-in supersonic motor, while the Pentax-original Quick-Shift Focus System allows instant switching from autofocus to manual focus operation. With its SP (Super Protect) lens coating that repels dust, water and grease and its weather-resistant construction that matches the weather-proofing of Pentax's DSLR bodies, the Pentax 55mm f1.4 DA* SDM lens is a truly top class piece of glass.